The BMW rim is absolutely fantastic. I was really skeptical about it, because I thought it was too big and too heavy, and I thought it could influence the way the force feedback. I was completely wrong. It feels just right. Highly suggested. Now I'm switching between the two rims depending on the car I want to use, and it's great that you can change it without problem whenever you want, even when you are in game. You just unplug one, and connect the other. The quick release make it extremely simple to do it, and you can switch rim in few seconds. Really nice, especially considering that you can't do that with the Thrustmaster T500. The only thing I'm not happy about is that similar buttons are not in similar position. To make an example, let's say that in my F1 rim I set my top left and top right buttons for the lateral view. When I switch to the BMW wheel I'll find them in completely different position. That was pretty disappointing. I'm surprised that they haven't thought about that. I hope there is a software that can switch between different button mapping configuration depending on the rim that is connected. I'll write more about the newly arrived cockpit, as soon as I try it a bit better. I received and assembled yesterday. Nice ! I do use the same kind of LG monitor at least (nice balanced backlight, I think it's a good monitor) . A Seat is a good thing for a straight back. I'm crawling myelf in front on my couch (sofa) without leaning my back onto a back of a seat or s.th., which is not perfect for the back (sitting a bit buckled all the time), -but not a big problem either. After some time spent on my new GT Omega Racing Evo, here is my short review. The package comes with every single piece nicely wrapped in bubble paper, and with clear instructions on how to build it. The build quality is really good. Much beyond my expectation. Squared tubes are big and heavy, well coated with good black painting. I haven't seen a single scratch, and I doubt it will be ruined too easily. Everything feels pretty stable and solid, especially while you are driving. The wheel deck wobble a tiny bit if you try to move it with your hands, but you definitely don't feel it while driving. The feeling is of having it really stable and well fixed when you are using it. No problems nor complains there. Wheel and Gear position are just right, and the seat is pretty confortable, and built with a nice looking pleather. Easy to adjust the rig to your convenience. They have chosen to have just 1 knob to move the wheel front back, and the same for the pedals. For everything else you need an allen screw. This is a plus point, since it gives the possibility to fasten it better and have a more stable rig. My only complain at the moment is on the lever that is used to put the seat forward/backard. That feels a bit weak, and the seat doesn't move so easily. I'll try to add some oil and see if that will fix the issue. Overall, I'm really happy about my choice. Very good value for money. Looks good, feels good. I was really surprised about the consequences of having a rig like this: in the past I've been trying to use heel and toe multiple times, but I always had issues with that. I couldn't use it effectively. It always felt un-natural. I was very surprised that as soon as I tried it on my new rig, with a proper racing position, and pedals firmly attached to it, I had no problems what so ever to use heel and toe. I was really shocked. I'm just loving it now, and I can't drive without using this technique. I also decided to change use the more dense oil on my braking pedal, increase the stiffness of pedals, and starting driving with shoes instead of socks. One more nice thing is that vibrations from your wheel are propagated to all your rig, and as a consequence, when you go over a kerb, for example, you feel it on your seat as well. Really nice feeling. So, as you can see, I'm really happy about it. Highly suggested. I decided to "pimp my rig", adding a new graphics card, the ASUS GTX780-DC2OC-3GD5 and the Buttkicker gamer 2 together with Simvibe software. It's absolutely stunning to see AC maxed out. The level of details is just incredible. I couldn't believe it was possible to set all the settings to the maximum and have no hiccups. To see that level of detail in motion is great. Buttkicker Gamer 2: Just few hours before trying it I discovered the buttkicker isn't working together with a USB headset like my G35, since it's disconnecting automatically the sound card. That was a big let down for me. Luckily there are ways to have everything working: the best solution seems to be Simvibe, a software that I was already planning to buy. This software "drives" the buttkicker directly from telemetry data from the main racing games (there is a beta plugin for AC, but I doubt there is something for nKPRO). The combination of the two gives a complete new level of immersion. Starting up a Ferrari 458 and feeling the engine rumble up to your spine is just fantastic. Going over a kerb and feeling the bump on your seat, or any single little bump on the road, or hitting a wall (it never happen to me usually, I had to do it on purpose just for the sake of the review ) and feeling the hit is definitely nice, boosting your experience even more. Despite my fear before buying it, the noise of the buttkicker is not too loud. You can control the "volume" of the vibration, and tune it for your needs. At the end you can get very good and perfectly defined effect even with pretty low vibrations, with noise comparable to the one of your force feedback. I still have to spend some time to fine tune all the effects of the Simvibe software, but I'm seriously impressed about it. Definitely something I would suggest! Andrea, fai bene se lo puoi fare a dotarti di tali meraviglie, invidia dovuta così come i complimenti! 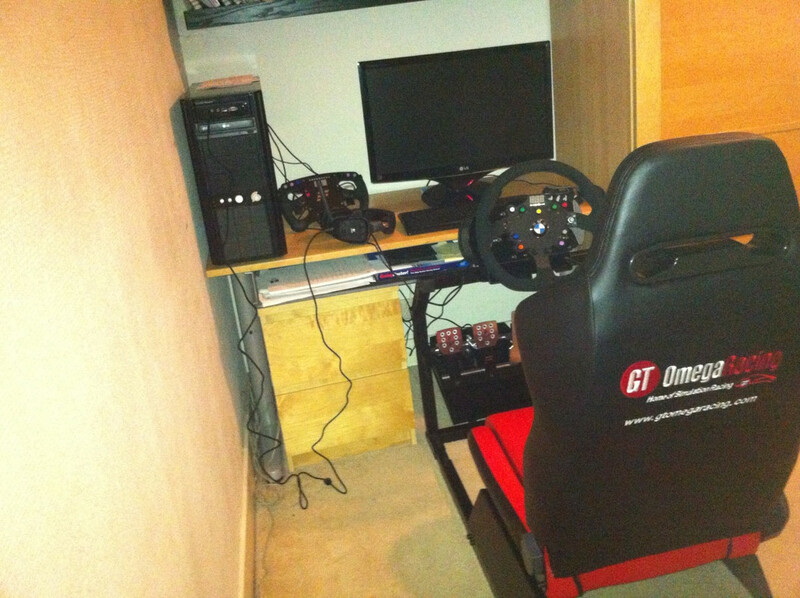 Andrea Lojelo wrote: I decided to "pimp my rig", adding a new graphics card, the ASUS GTX780-DC2OC-3GD5 and the Buttkicker gamer 2 together with Simvibe software. I have a GTX 780 driving 3 24in 1920x1200 monitors and AC seems to be fine at 80/90fps. Not sure I'm running everything at absolute max - I think AC limits some options on a triple screen set-up.